The longevity of your water heater is directly tied to how much wear and tear you put it through. Unless there is some sort of disaster, running out of water is not something anyone in Kansas City has to worry about but that doesn’t mean you can’t become a proactive water user by following some of these helpful tips. Not only will your water heater last longer, but your bills should be greatly reduced. The kitchen sink is a major culprit of water waste. Too often the faucets are kept running while doing the dishes as opposed to filling up the sink with water and cleaning the dishes that way. You could also rinse off veggies and fruit in the same way. If your sink is kept clean then there is no reason why that water won’t be clean as well. Also consider how often you use your garbage disposal. While this is a very convenient device, you could put those food scraps to better use in a backyard compost pile. According to the EPA the typical American home ends up wasting up to 10,000 gallons of water every year through a combination of leaky faucets and running water to excess. The bathroom is another water waste zone you need to rethink. Your first consideration would be to take shorter showers. This is really where the pressure on your water heater builds up as it warms that water. The longer you stay in a hot shower, the more your water heater has to go into overdrive to keep up with the demand. Do you really need a 20 minute shower and the same “work” can be accomplished in 5 minutes? There’s also no need to run the faucet while you are brushing your teeth. The goal should be to get in and out of the bathroom as quickly as possible. Outside you can conserve water by how you use it. Yes, your garden needs water to grow but do you really need to hose down your patios or walkways when a good sweeping will do the trick? Also, stick to the schedule when it comes to watering your lawn or garden. It will help maintain your water usage efficiency. Even following all of those tips can’t stop time and that’s probably the biggest enemy for your water heater. 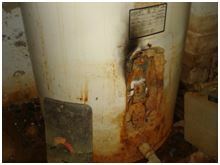 If your old water heater has reached its limit and you are ready to swap it out, one of the first calls you should make should be to Junk King Kansas City. These are the top professional Junk Haulers based in Kansas City who can remove that water heater without breaking a sweat. As you make way for the new water heater, you can also use the Junk King crew to clear out some other junk items which might be cluttering up your basement. Once the new water heater is installed, keep conserving and your lower water bills will help pay for that unit in no time! This entry was posted in appliance disposal, junk king kansas city, kansas city hauling, KC Junk Removal, water heater disposal and tagged get rid of water heater, junk king kansas city, kansas city junk removal, water heater disposal on January 24, 2012 by Mike Stroud. Last updated August 2, 2017 .